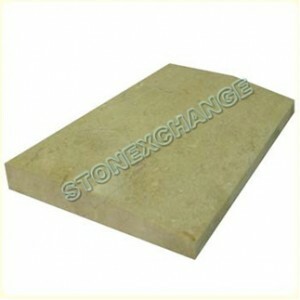 Design instructions for residential or commercial interiors often specify natural stone floor saddles. These transition pieces are generally used to complement other marble, granite, or travertine installed as a flooring surface or window sill. Transition thresholds are expensive if purchased in small quantities. This is because a great deal of work is performed by the manufacturer to ensure perfect shaping and finishing of the product.Construction contractors often need hundreds of marble thresholds for a large residential or commercial building project. Unfortunately, the per-piece price of this product is usually high, even on bulk orders. The exception in the industry is the direct importer and distributor, and this is what set Stonexchange apart from resellers of natural stone materials and accessories.Stonexchange operates its own manufacturing facilities located overseas, and we import huge amounts of marble thresholds on a constant schedule. We offer our commercial clients the absolute rock-bottom prices on fabulously crafted floor transition saddles, and we ship our product in full-crate or full-pallet loads to clients located across the entire nation. Our company maintains a large inventory of marble thresholds in our Miami-based warehouse. We know what styles of floor thresholds are popular, and we import large amounts of these products on a regular schedule. This means that our customers can enjoy immediate price quotes, rapid order fulfillment, and reliable overland shipping.Stonexchange operates its own fabrication and finishing plant. We are constantly ordering huge amounts of material, manufactured from marble extracted from nearby quarries. The finished thresholds are sent via transatlantic container ship to our distribution headquarters in Miami, and the pieces are stored in full containers, ready for immediate shipment to commercial clients. Because we do not involve ourselves with resell merchants but instead import material from our own manufacturing facilities. we can offer commercial retailers, home improvement centers, and commercial subcontractors the lowest per-piece pricing in the industry. This wholesale cost is not a negative reflection on product quality. Our natural marble stone floor thresholds are beautifully crafted, expertly polished or honed, and sized exactly to industry standards. Natural stone transition thresholds are much in demand. Until recently, few importers could guarantee their customers a reliable supply of these floor accessories. Thresholds are usually placed in doorways or wherever there is a meeting of two different floor surfaces. The rise in popularity of marble thresholds is due to their increasingly low price if ordered from a bulk supply manufacturer.Stonexchange offers top-quality marble thresholds in several popular styles. These include Crema Sahara Marfil, Nuevo White Carrara, and pure white engineered stone. The latter is a glass-and-resin product, often used in high-priced interior design projects.Crema Sahara Marfil thresholds are cream-and-beige in appearance, with an average amount of streaking and spotting. This shade of marble is popular in residential interiors, especially when a neutral color is desired to complement darker shades used for floor tiles and furniture. Crema Sahara Marfil is suitable for projects specifying Bursa beige, Botticcino beige, or light noche.Nuevo White Carrara is the shade of marble usually seen in stone steps and stone columns. Its off-white color and light gray streaks have long been a favorite among designers wishing to create a stately appearance. This shade of marble looks its best when used for the floor thresholds, window sills, and foyer tiles.Engineered stone is very expensive to produce, and contractors will not find a reliable source of bulk quantities unless they purchase directly from the manufacturer. These thresholds are beautiful in appearance, with no streaking or spotting. Engineered Pure White Thazoz thresholds available from Stonexchange are affordable because they are sold in full-pallet orders. • Double Hollywood bevel thresholds. Our standard double bevel thresholds have a 1/4-inch smoothed bevel along both long sides. These floor saddles are given a high-quality polish after being cut and shaped. The standard length is 36 inches, and the product is available in widths ranging from 2-6 inches.Our single Hollywood bevel thresholds have a wider, 1 3/8-inch bevel along one long side. They are also available in widths from 2-6 inches. These thresholds are commonly used as transition saddles where a meeting of two different floor surfaces coincides with a doorway.Our double Hollywood bevel thresholds have a 1 3/8-inch bevel on both long sides. They are popular for use as a floor transition saddle in areas of high traffic. All of our thresholds are sold in the standard 36-inch length, and the standard thickness is 5/8-inch.Customers who purchase bulk quantities of thresholds will save money when doing business with Stonexchange. Because we sell only to commercial clients such as flooring product companies and construction contractors, we can offer lower than the average retail price on minimum piece delivery. Depending on the style and width chosen, our minimum order ranges from 50-200 pieces.We also provide non-standard sized marble transition pieces upon request. These longer or wider pieces must be specially cut and shaped at our overseas fabrication center, but we do not charge extra for this service. Clients can expect a lead time of six weeks for these orders, but will receive an immediate price quote and estimated delivery date. Large orders for marble thresholds are placed by retailers because of a request made by a contractor. This is usually a large-scale residential or commercial development project, and the contractor needs not only an affordable source of material but also a reliable delivery schedule. Unless the retail merchant or dealer is in direct contact with an importer and distributor that manufacturers the product, neither of the above requirements will be met.Flooring companies will retain a larger number of commercial contractors as customers if the requested product is available year-round, can be delivered in just a matter of days, and is priced well below the industry norm. Business will also increase if the retailer keeps a reasonable amount of product in inventory. This is because marble thresholds are part of the final interior design, and the eventual purchaser of the property often makes last-minute changes involving the flooring products.Contractors and independent installers benefit from doing business with Stonexchange because their project often specifies two or three different styles or sizes of material. Being able to procure each and every type of transition saddle in a single, mix-and-match order is quite a relief to those subcontractors wanting to stay within their budget. Our company does not charge extra for a large order consisting of different marble types or several different material widths.Most importantly, Stonexchange guarantees minimum breakage during product shipping and delivery. We carefully pack our product in crates or on pallets using a specially designed cushioning pack. We figure in minimal breakage when we produce an price quote, and we contract with reliable overland shippers experienced in handling delicate products such as natural stone. More and more buyers of natural stone materials are looking to direct importers and distributors as their source for high-quality product. The importing of marble products such as thresholds, window sills, and floor tiles is a specialized business, one that cannot make a profit for the distributor unless direct sales operations are involved. 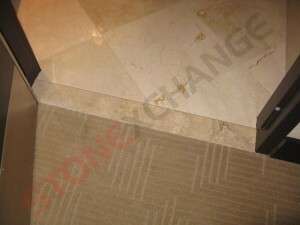 Stonexchange offers commercial clients the opportunity to deal directly with the manufacturer, cutting out the middle level reseller and the inflated prices that come with product changing hands before reaching the buyer.Marble thresholds and flooring tiles are an excellent investment in the residential or commercial property so long as the initial cost is affordable. Marble retains its value well because it is low-maintenance and quite durable. Nonetheless, special consideration must be given to the actual cost of the material. Unless the installer can find the required product in bulk supply and at reasonable wholesale prices, the entire industry suffers. Expect the finest quality natural marble stone thresholds and other marble products at exceptionally low wholesale prices. This is what customers experience when dealing with Stonexchange. We invite all interested merchants, subcontractors, and independent floor product installers to contact us for the latest information on prices, shipping policies, and product specifications. We operate on the principle of excellent quality at an affordable price, and we look forward to supplying you with the finest marble flooring transition pieces available anywhere.